Hana Lee Crisp and Bert LaBonté in I am a Miracle. Photo by Pia Johnson. Marvin Lee Wilson was executed on 7 August 2012 for the murder of a police drug informant. Tested to have an IQ of 61, he should have been ineligible for the death penalty under a United States Supreme Court ruling. Wilson’s IQ test was dismissed as evidence because it was administered by a PhD candidate rather than a clinical psychologist. On this technicality, his execution proceeded. Writer Declan Greene describes I am a Miracle as “a play for” rather than about Wilson, but does he nevertheless range too far from his subject? 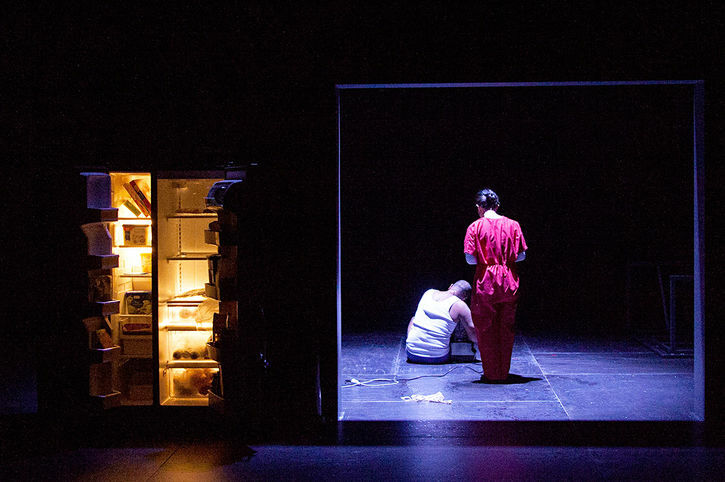 The play’s two acts provide historical and contemporary snapshots of racial inequality. These vignettes are framed by Bert LaBonté’s impassioned monologues as a sympathetic observer of Wilson’s plight. Bombast paints a thin veneer over an unsatisfactory ending. As giant incandescent bulbs blind the audience, LaBonté offers a rousing call to arms. He pledges to carry Wilson’s memory to wage cosmic revolution. He wants to undo not just generations, but billions of years of inequality. Two acts seem too few for a play that addresses universal injustices. The sense of incompleteness is almost musical. Three spotlit narratives of murder and subjugation might have given a better sense of the universality of racial subjugation. As they stand, the two acts seem more like separate plays. Melita Jurisic delivers a grimly humorous story of slavery in a nineteenth-century Dutch colony. In what was a brilliantly sustained escalation of tension, LaBonté plays a mentally ill man falling through the cracks in modern-day Melbourne. A live musician on stage is a perpetual question for the audience, but director Matthew Lutton made a virtue out of soprano Hana Lee Crisp’s presence. She was never left hanging by the wings, but appears at intervals starkly framed by an arch or in front of a curtain. Lutton describes her as “an archangel of justice,” and her pure renditions of David Chisholm’s settings of biblical text elevates the audience above the play’s worldly themes of inequality, mud, and death. The three actors all lend beautiful and distinctive voices to the stage, which is otherwise suffused with subtle choral textures by sound designer Marco Cher-Gibbard. With every piece of the play’s promotional material foregrounding Wilson, the audience may be surprised by the marginal role of Wilson’s story. As an audience we are always watching LaBonté watch Wilson. We never hear Wilson’s words or learn anything about his life, but are left with the consolation of religion and ambient rage.